Below is a music video made by a Polish pop group who muse over why we should not forget what the 1st Independent Polish Parachute Brigade did for Poland. At 0:20 you can see footage of the Katowice Parachute Tower (which is at the bottom of this page), this tower is near identical to the one that existed at Lundin Links, Fife. The video helps you understand what the parachutists went through as part of their training. The last remaining parachute tower in Poland is in Katowice. 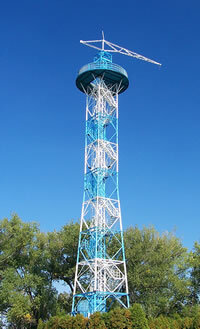 Built in 1937 it is 50 meters tall and was used by the 73rd Infantry Regiment as an observation tower. It's design and size is very similar to the parachute tower associated with Largo House in Upper Largo, Fife. The parachute tower in Fife though was actually located 2 miles away from Largo House and at Lundie Tower in a place called "Lundin Links".